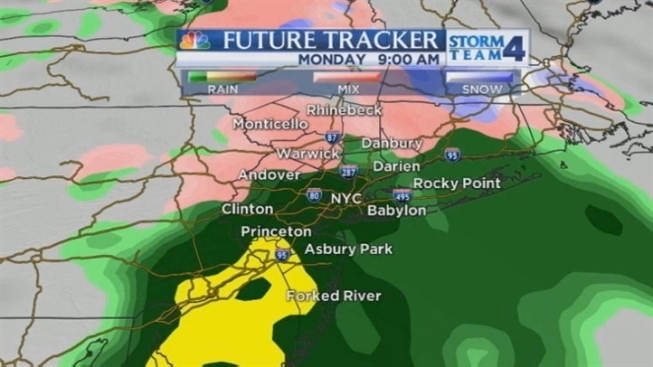 A freezing rain advisory will be in effect for much of the region until 9 a.m. Monday, threatening to worsen the rush-hour commute on the first workday since Friday's blizzard. The rainfall comes as much of the metro area is still trying to shovel out from the weekend's storm, with piles of snow still lining streets and some cars and parking lots still buried. The MTA said Sunday night that service would be running normally on buses and subways, though there are some disruptions in eastern portions of the Long Island Rail Road and Metro-North. In the northern counties, a winter weather advisory is in effect until noon Monday. Rain moved in overnight, starting out as a mix of rain, snow and ice north and west before it changed to rain as warm air came in from the south. The rain may be heavy at times before tapering off from west to east in the mid-afternoon. There is some good news: temperatures Monday will be relatively mild, with highs in the mid- to upper 40s. Sunshine should return Tuesday, but winds will pick up as well.